The Ebola-Tx trial, led by the Antwerp Institute of Tropical Medicine (ITM), evaluated the effectiveness of convalescent plasma (CP) therapy. Ebola patients in Guinea were giving a transfusion of plasma donated by survivors of the disease. Plasma is the liquid part of blood that in survivors contains antibodies against the Ebola virus. It was thought this would boost the immune system of Ebola patients and improve their chance of survival. Using antibodies contained in the blood of recovered patients is a well-established technique that has been used for several other infectious diseases including diphtheria and influenza. At the time of administration during the trial, the level of neutralising antibodies against the Ebola virus in the donor plasma was unknown. The necessary tests to determine the amount of neutralising antibodies had not been developed. Plasma samples have recently been shipped to France for further analysis with additional findings expected in the coming months. However, the research did find that a single administration of convalescent plasma do not significantly improve the survival of Ebola patients. Further analysis will investigate if the patients who received plasma with the highest levels of Ebola antibodies, were more likely to survive than those who received plasma with low levels of Ebola antibodies. Up until recently outbreaks of Ebola have been small and brought under control relatively quickly, which has meant that there has never been the opportunity for a well-designed study of this therapy. Dr Calum Semple, from the University’s Institute of Translational Medicine, collaborating with researchers in the International Severe Acute Respiratory and Emerging Infection Consortium (ISARIC), developed a convalescent plasma protocol in readiness for future outbreaks of public health importance, such as Highly Pathogenic Influenza, Middle East Respiratory Syndrome (MERS) and Viral Haemorrhagic Fevers (e.g. Ebola). Dr Semple also leads an ongoing sister study of Convalescent Plasma and Survivors in Sierra Leone (Ebola_CP) with colleagues from the Antwerp study at the 34th Regiment Military Hospital and Ministry of Health, Freetown Sierra Leone, funded by The Wellcome Trust. 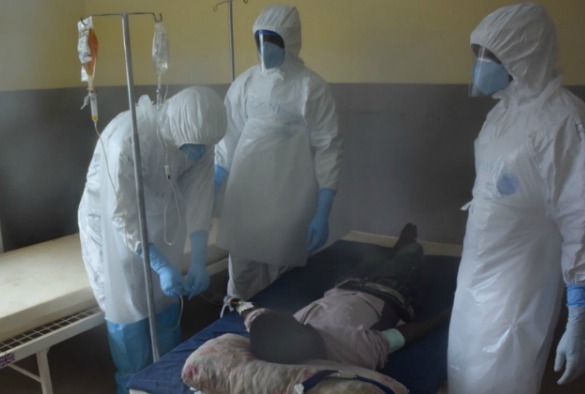 Co-ordinating Investigator for the Antwerp Institute of Tropical Medicine, Professor Johan van Griensven, said: “This might not be the answer we had hoped for, but in the absence of a treatment for Ebola it represents crucial information about the role of convalescent plasma against this horrible disease. Dr Semple, said: “Convalescent plasma therapy has been used since 1891 to treat severe infectious diseases. We wanted to find out whether Ebola survivor’s plasma contains protective antibodies and if their plasma can be used safely to reduce the number of deaths in this and future outbreaks.